Miles Kimball Battleship Hand Held Game Just $5.10! Down From $17.99! You are here: Home / Great Deals / Miles Kimball Battleship Hand Held Game Just $5.10! Down From $17.99! Sears has this Miles Kimball Battleship Hand Held Game on sale for $5.10 (Reg. $17.99)! 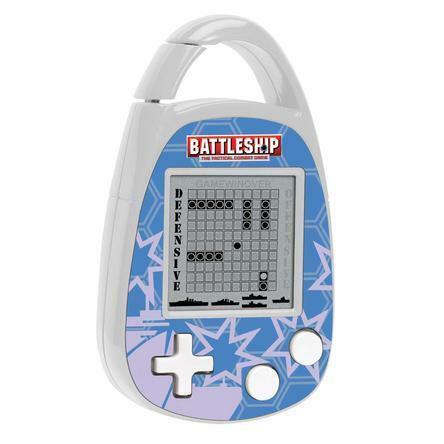 Battleship Hand Held Game : The legendary, tactical combat game goes electronic with this battleship handheld game from Miles Kimball, so you sink your enemy’s fleet on the go Includes clipon handle. Uses 2 AAA batteries (not included). 4″ long x 2 1/2″ wide. Ages 7 and up. The legendary, tactical combat game goes electronic with this battleship handheld game from Miles Kimball, so you sink your enemy’s fleet on the go! Includes clip-on handle. Uses 2 AAA batteries (not included). 4″ long x 2 1/2″ wide. Ages 7 and up.